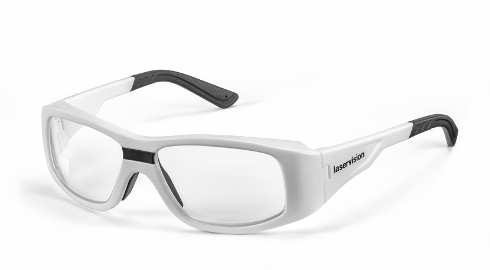 The laser safety spectacles with frame F20 are very light but rugged. The soft nose pads ensure a comfortable fit. With its broad temples which therefor include side protection this frame covers at the cheek and at the eyebrows very well. The cold malleable temples allow an easy adjustment to nearly all face forms. The filters for this frame do have base curve 6 and ensure a good field of view as well as a fashion design. The frame F20 is colored white. For a professional cleaning laservision recommends the cleaning station.